Bus priority systems have a track record of social and environmental benefits for cities. Now, research shows that bus priority systems – when accompanied with key road design features – can save lives in cities. Photo by Mariana Gil/EMBARQ Brasil. Traffic safety has become an urgent issue for cities around the globe, with traffic deaths claiming over 1.2 million lives per year according to the World Health Organization (WHO). Without proper action, this unacceptable trend is expected to make road fatalities the fifth leading cause of death by 2030. Furthermore, low- and middle-income countries account for 90% of all traffic deaths worldwide, and developing countries are also experiencing rapid growth in vehicle ownership. About half of all fatalities from traffic crashes occur in urban areas. To put it simply, traffic safety must be a priority if we want to build more sustainable and livable cities. One route for achieving this is to expand and enhance sustainable transport solutions like bus priority and bus rapid transit (BRT) systems. New research shows that – when accompanied by improved road design – implementing bus priority systems can reduce severe and fatal crashes by 50%. High quality BRT and bus priority systems are helping meet the increasing demand for urban mobility. BRT has become a popular solution due to its relatively low capital cost and short construction time compared to rail transit systems like metro. According to the BRTdata.org database, 31 million passengers ride BRT or bus priority systems every day, and the number of cities with BRT systems is on the rise, reaching 189 in 2014 from just 20 in 2002. 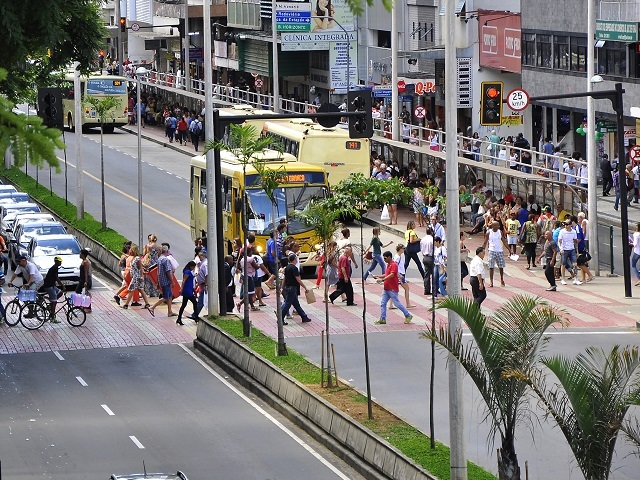 The growth of BRT systems – especially in developing world cities – can reduce reliance on cars and motorcycles, both of which are shown to amplify traffic safety challenges. Despite the growth of BRT systems worldwide, their impact on traffic safety is not as well understood as their effects on other social, economic, and environmental impacts like greenhouse gas emissions and travel time. New research from WRI Ross Center for Sustainable Cities’ EMBARQ initiative fills this gap by examining the traffic safety aspects of bus priority systems. It draws on data analysis, road safety audits and inspections of over thirty bus systems around the world, and simulation models testing the impacts of safety measures. The new Traffic Safety of Bus Priority Systems report shows that bus priority systems have had significant positive impacts on traffic safety, reducing serious crashes by 50% on bus corridors in cities like Ahmedabad and Guadalajara. The design of streets and intersections along a given transit corridor plays an important role in traffic safety. In order to achieve the safety benefits of bus priority systems, cities must incorporate key road design features. For example, wider streets with more lanes tend to be more dangerous for pedestrians and cyclists. Wider streets mean pedestrians have longer distances to cross, and these streets tend to have longer signal intervals that make pedestrians more likely to become impatient and cross on red. EMBARQ found that each additional meter of a pedestrian crossing increases the risk a pedestrian will be hit by 6%. When implementing a bus priority system, however, cities can break up wide roads on a transit corridor using central medians. A central median for pedestrians can reduce fatalities and injuries on a bus corridor by 35%. EMBARQ also studied Mexico City’s implementation of Metrobús Line 4, which provides a prime example of how the design of a BRT corridor can improve traffic safety, even in a complex urban setting. Metrobús Line 4 is located in the city’s historic downtown, with narrow streets and large crowds of pedestrians. The presence of many pedestrians is common for BRT lines in many cities, and poses design challenges for bus corridors. The design of Metrobús Line 4 includes a number of significant safety provisions for pedestrians, including pedestrian signals, protected refuge islands, bollards to prevent cars from parking on sidewalks, and improvements to pavement and signage. Our research estimates that the overall design efforts on Line 4 alone could save 12 lives every year. EMBARQ’s research on bus corridor safety is part of a larger effort to advance a Safe System approach to traffic safety. This approach recognizes that road users are fallible, and that their mistakes can be deadly – especially for vulnerable road users like children, the elderly, pedestrians, and cyclists. Beyond behavioral issues like drunk driving and seat belt and helmet use, traffic fatalities are the result of poor road design. The Safe System approach focuses on improving the planning and design of road systems to guard against human errors. With smarter design on bus corridors, cities can minimize road users’ risk and save lives worldwide. Learn more about designing safer bus systems in the Traffic Safety of Bus Priority Systems report, made possible through funding from Bloomberg Philanthropies. 189 cities and counting: Track the growth of bus rapid transit on the redesigned BRTdata.org!